As we keep our natural teeth longer and longer, our teeth are often subjected to more use, grinding, clenching, and multiple fillings over the years. 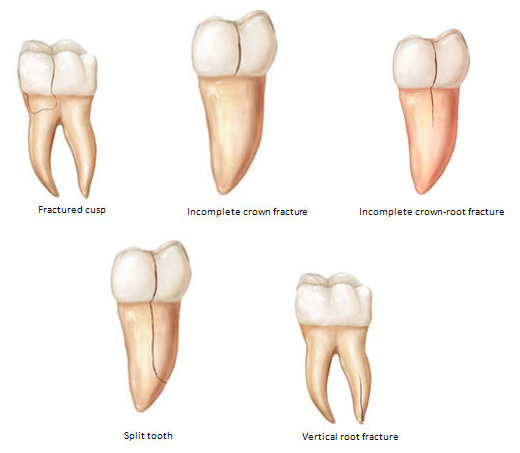 All these can compromise the integrity of the tooth, and lead to fracture. Not all broken or cracked teeth need root canal treatment, as many can simply be protected with a crown and restored to normal form and function. A root canal may become necessary on fractured teeth that have become painful. It usually begins as an inconsistent, sudden, sharp pain during chewing, which is difficult to localize. The sharp pain is due to irritation of the pulp as the fissure is wedged open. If the crack is deep enough, there may be bacterial influx into the pulp, leading to further irritation, inflammation and damage, often accompanied by intense and lingering pain to temperature extremes. At this point, as long as the tooth has not split into distinct segments and the root has not fractured in a vertical fashion, endodontic treatment can help! A root canal can be done to remove the offending pulp and a full crown will need to be placed soon afterwards to minimize crack propagation. Sometimes root canal therapy is recommended for broken teeth that have no symptoms, if much of the natural structure has been destroyed and a post must be cemented into the root for increased retention of the planned crown. If it is determined that the tooth has cracked below the gumline or bone level, a root canal will not help, and extraction is generally the only viable option. For more in depth information, click onto the AAE logo for a direct link to the site.